Cummins, a truck manufacturer, has announced an all-electric tractor unit. Check it out! My name is Whitney Roberts, I am from Kingston, New York, just about an hour and a half north of NYC. I wanted to thank you for the help with a back to school project I've been working on with my son Evan, about the history and future of cars and trucks. We really enjoyed your page, http://www.csevc.com/p/organizations-links.html , it was helpful and fun while we have been doing research. He's been putting together a power point presentation, the students were asked to come up with a hobby or something they enjoyed over the summer and make it an educational topic for them to present to the class in a few weeks! I thought this was a cool way to get back into a studying mindset while still having fun! Hybrid and electric vehicles, their progress over the last 15-20 years, and their role in the future, is an important issue and Evan is focusing on that aspect of the automobile world quite a bit for the project. 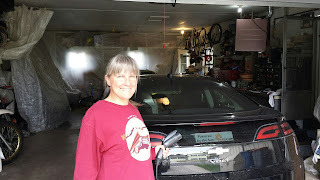 He is really into Teslas, but my husbands friend who has a Chevy Volt took him for a ride in that, and he loved it! Personally, I'd really like to look into getting a Model 3 when the demand for them dies down a bit. Last night we were doing some research on hybrids and electrics, and he found this article, https://www.titleproloans.com/resources/green-cars-and-the-environment/ about different electric cars and their ranges. I thought it was cool and helpful, and was hoping you could add it to your resources? I would really love to show Evan he could contribute some cool Hybrid stuff to your page! Thanks again for the help with our back to school projects! I can't believe next weekend is Labor Day, where did the summer go? I hope you enjoy the article, and if you'd like, I'd love to share how his presentation goes and the final product when we get it done? Hope to speak soon, and have a wonderful day! 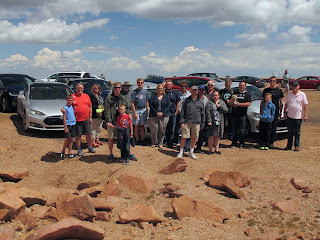 We had 16 cars climb Pikes Peak today - Teslas, Volts, i3s, Leafs, Sparks and Bolts. And a good time was had by all. Dan Rosenblatt's stats netted out to 2 battery miles consumed for the 38 miles round trip (64 consumed going up, 24 gained going back down). My numbers were almost the same, I consumed 1 mile of battery range for the trip. Hank & Di Graski met several members of the CSEVC at the recent Old Colorado City car show. They live in Colorado Springs, CO and have a 2013 Black Chevy Volt. Make them welcome when you meet them! Our member, Dan Rosenblatt, went to Wyoming to see the total eclipse. He had 10 cars ahead of him waiting to Supercharge in Lusk, WY on the way back. Did you all see the ECLIPSE yesterday?? Celestial show! Did anyone go up North to see the totality? See any other EVs? Take any photos? Send them to Wilson! If so, we will put some on the website! Thanks! 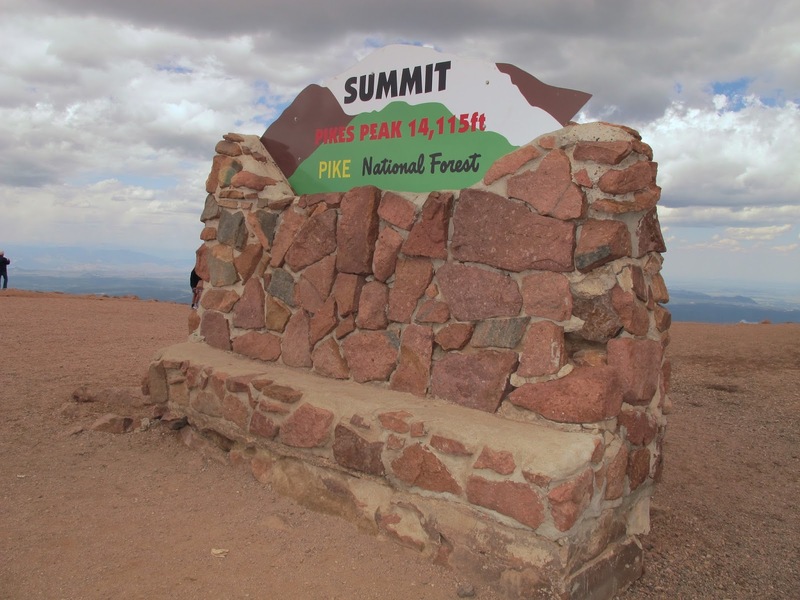 Saturday August 26: The THIRD annual Milo Eckles EV Drive Up Pikes Peak! (Milo started this thing, three years ago). This year, this VERY POPULAR rally takes place THIS Saturday, August 26, 2017. Put it on your calendar now! All Leafs, BMWs, electric bikes (?? ), etc., are invited and CAN try to make it to the top! All EVs are welcome. If you cannot make it to the top, just pull off, park, and hitch a ride with one of our friendly EV club members! Get dropped off on the way down, and regen plenty of power when driving back to Colorado Springs! This is THE ONE EV trip that ANY EV can be part of! Can’t make the top? Just stop and hitch a ride! No sweat! Tons of fun! Be there or be square! It is truly one of the most fun EV events every year! We have been given approval for this rally by the mountain itself! DISCOUNT: Normally $15 per adult and $5 per child, WE GET: $10 per adult and $2 per kid! • The trip up Pikes Peak is LESS than 30 miles, one way! SHORT DRIVE! Teslas: Tesla owners will probably not need any additional charge to make the top. Come as you are. OTHER EVs: Give your car a MAXIMUM charge and hope for the best. LOTS of Leafs have completely made this trip! The drive back will regen TONS of power all the way back to Colorado Springs! • Meet up: 11 AM! If you want the DISCOUNT, you must go through the entrance gate in a group!! Please meet up at the parking lot near KFC, 3101 W. Colorado Avenue, Colorado Springs. This is actually the Southwest corner of the intersection of 31st Street and Colorado Avenue. There is easy entrance onto Highway 24 from there. We will chat for about 30 minutes with the other EV owners! I will be there to lead the group up! • Around 11:30 AM: Off we go! I will lead the group, (necessary, since I have the group discount paperwork). If you are driving a shorter range EV, and are worried that you do not have enough charge to make the top, get directly behind me. Long range vehicles: Bring up the rear! Short range vehicles: If it becomes clear that you CANNOT make the top, TURN ON YOUR EMERGENCY FLASHERS! That will let those long range vehicles behind you know that you are about to bail. Pull off at any parking place, lock your car, and get a ride to the top with a friendly club member behind you. • Lunch: You can get something to eat at the summit house. We probably will not be able to eat in a group, due to all the tourists. Find someone you like and eat with them! Buy souvenirs, such as , “I made it to the top!” Take photos, weather permitting. Some places at the summit actually have cellular service! Depending on your carrier, you may or may not be able to make a call. Results are variable! Walk around the summit and see if you can get a bar. • When most people are ready to leave, we will depart, although you may stay as long as you want, up to closing time. Go down slowly, not in a group, pull off, look around, take photos, take your time, then return to Colorado Springs. The end. • PLAN AHEAD! Temperatures at the summit will vary from chilly to DARN COLD! Break out some cold weather gear. I took a light jacket last year and it was inadequate! Mid-heavy coats, knit hats and gloves are recommended! The WIND may be howling! Questions? Comments? Compliments? Email me. Complaints? Email Wilson. (Heh heh). This is just an FYI, the Customs & Classics Car Show is this Aug. 20 (Sunday) and the promoter would be thrilled if we had a lot of EVs at the show. Since the show is in Old Colorado City, any Colorado Springs EV owner can make it! If we get 10 paid registrations from our club, we get vendor status and get a tent and guaranteed adjacent parking. I'm attaching the show flyer. Registration is $35, you must pre-register online at http://www.aceent1.com/customs-classics-car-show/ . Please let me know if you plan on going. I have to tell the promoter if we're going to have enough people from our club to request vendor parking. If the registration process asks for a car club, say CSEVC. The PDF form to register is located here. This is a 9:00am - 3:00pm show, so you have to stay the designated hours for safety reasons. I usually attend this event since there is a HUGE number of cars and you have all of Old Colorado City to visit - restaurants, shops, ice cream stores, Bancroft Park, etc. So especially for our non-Tesla owners, this is an event you may be interested in. We had excellent foot traffic at the First Saturdays Car Show on Powers Blvd. this past Saturday in Colorado Springs, and this is the same promoter. If you don't want to fight the eclipse traffic, go to the show! P.S. Don't forget our Cripple Creek Rally this Saturday! Happy Summer, everyone! Tomorrow is our next Denver Tesla Club event, the second annual Mt Evans Hill Climb! We will be meeting at Clear Creek Middle School just outside of Idaho Springs on Chicago Creek Road between 8:00 and 8:30. The weather still looks nice, but be prepared and bring a jacket. It was COLD last year on top. We will go rain, shine, or blizzard. This year’s event will be sponsored by Sean Mitchell of COListings Real Estate, so for entrance to the park, there is no cost. The plan is to meet afterwards at BeauJo’s Pizza in Idaho Springs after we get down from the top.